If you’re going out to dinner at a craft brewery or a local pub, you might think about what you want to eat before you even get there. But what about the drink you’ll potentially have with your food? 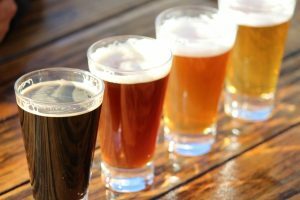 The craft beer market is worth approximately $19.6 billion, and with so much time and effort being put into creating these unique beers, it’s important to consider how best to pair them. Not only will you be enjoying your drink to the fullest, you’ll be honoring the brewery’s initial goals for the beer. So here are a few of the best ways to pair beer with a meal. For dishes with a base of grains like farro or wild rice, a clean, crisp beer is going to be a great pairing. Some of the best craft brews to choose from include amber lagers and bohemian-style pilsners. The light, crisp nature of these brews will complement the grain dishes and steer clear of overwhelming the palate. So if you’re ordering a risotto dish, try one of these beers as a pairing! Dishes with lamb, beef strip loin, and hearty root vegetables are excellent choices for a winter meal, but what should such rich, hearty food be paired with to be fully enjoyed? Local watering holes and craft beer pubs should provide something tart and refreshing such as an American brett or a Belgian-style flanders. Combining the two flavors brings out the best in both the dish and the craft beer restaurant’s drink. Seafood is certainly a popular choice for dinner, especially during the summer. If you want to pair a seafood dish such as clams, scallops, or lobster with good craft beers, consider choosing a saison or a hefeweizen. The fruity flavors in these beers offer a sweetness and a little bit of spice that balances and cleanses the palate after a bite of seafood. Finding good craft beers to pair with food isn’t too difficult, but it helps to have a sort of guide to work with before you go pairing something wild! Take these pairings into consideration and your next pub meal just might be the best you’ve ever had. If you want to test out your pairing knowledge, Dead Presidents Pub’s upcoming Kickoff Crab Feast is the perfect venue.